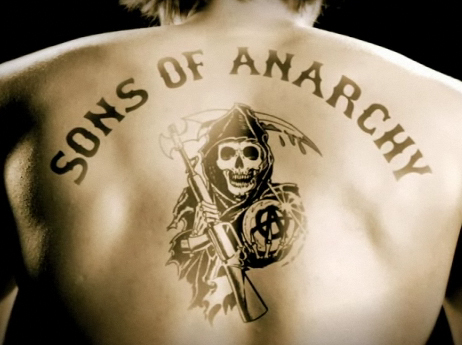 Quick Thoughts: SONS OF ANARCHY, "Fruit for the Crows"
With Glee on a break until November, I'm able to dedicate more time to Sons of Anarchy, and boy has this been a good time to refocus on SAMCRO. Season 4 started off slow, but it's hitting high gear and has been turning out some tense episodes. At first, I really wasn't on board with all of the drug cartel business because it felt trite. Yes, there have been some cliche moments, but the best moments have nothing to do with the drugs but how being in bed with the Cartel has torn apart the MC. The fact that Bobby's been pushed over the edge, and that he had to stones to challenge Clay's leadership was more gripping than any of the actual drug stuff. Everything that involved Tara and the "death threat" felt excessive, but I see its value as a plot device. The world of the Sons has always been a dangerous one, which is something that shouldn't surprise Tara, but she's never had it stare her in the face like this before. I still think it's all going to end badly for her because that's the only way Jax will stick around, but I hoped the writers would have progressed this story differently. I know a lot of people out there are not fans of Juice's season long arc, but I think it's been some of show's best material, and they way it may or may not have ended was a bold move and I have to compliment Kurt Sutter for going there. Personally, I'd like to see the story take an even darker turn, but I can see it work either way. Regardless, Theo Rossi has churned out some great moments this season. I don't know if I'll ever be a die-hard Sons fan, but I'm glad that I've been checking it out this season. It still has some to work out, but so far Season 4 has been non-stop craziness and it's been working for me.